Artists, students, and anyone else who works at a desk all day, it's time to take a stand! Watch the video below. It's only 6 minutes long. 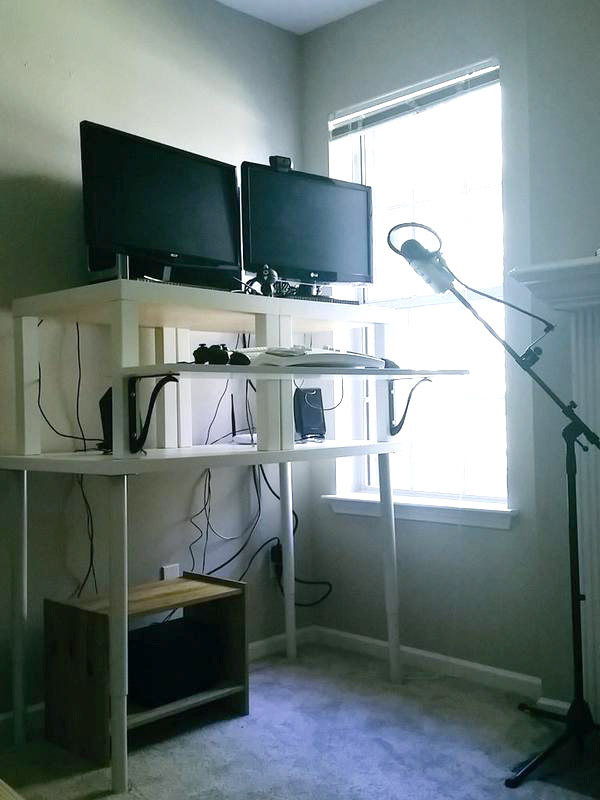 I started using a standing desk three years ago and I've never looked back. 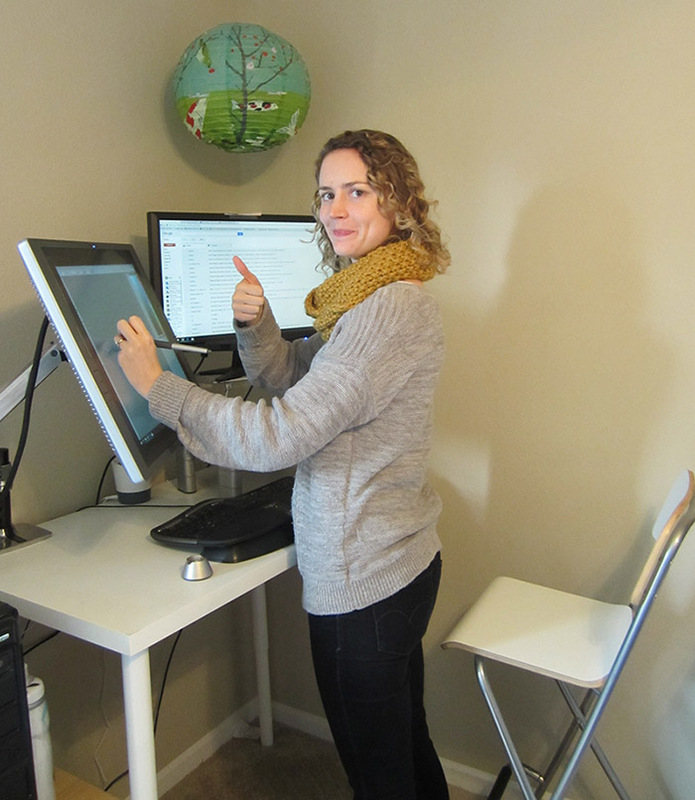 I feel much more healthy and comfortable at a standing desk, and I get tension headaches less often than I used to. When I was traveling the world last year, working at whatever desk or dining table was available, I really missed working at a standing desk! Now, I don't stand all day. I have a tall chair that I use about half the time. I'm quite squirmy, and will switch between sitting and standing every 20 minutes or so. Sometimes I dance while listening to music - especially if I've got some Bollywood tunes playing. I'm also quite animated when listening to the Hamilton soundtrack. Sometimes I stand on one leg like a flamingo. Great story, Kelley! Anyway, if you're interested in a standing desk, I recommend that you give it a try first by setting up a makeshift version. 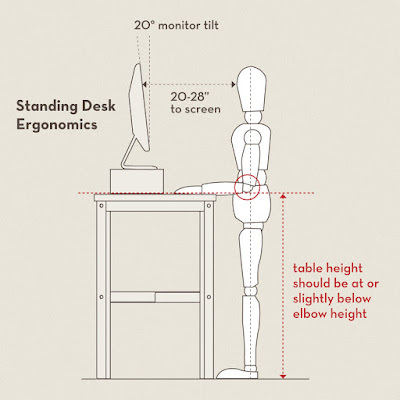 Just use your regular desk, and use boxes or books to lift up the monitor to eye level, and the keyboard and mouse so that your arms are at about a 90 degree angle when standing. This was my first-ever attempt at a standing desk. Standing will take some getting used to. You will probably feel achiness in your legs and lower back, but this should go away after a week or so. (However, if you're in a lot of pain, your setup may not be correct for your height.) Be sure to hop on and off the bar stool at frequent intervals. If you have a hardwood floor, put a rug or some other kind of cushion under your feet, or wear comfortable slippers. If you get hooked on standing, you have two choices for standing desks: buy one, or make your own. Pre-made standing desks tend to be very expensive, especially the adjustable-height kinds. 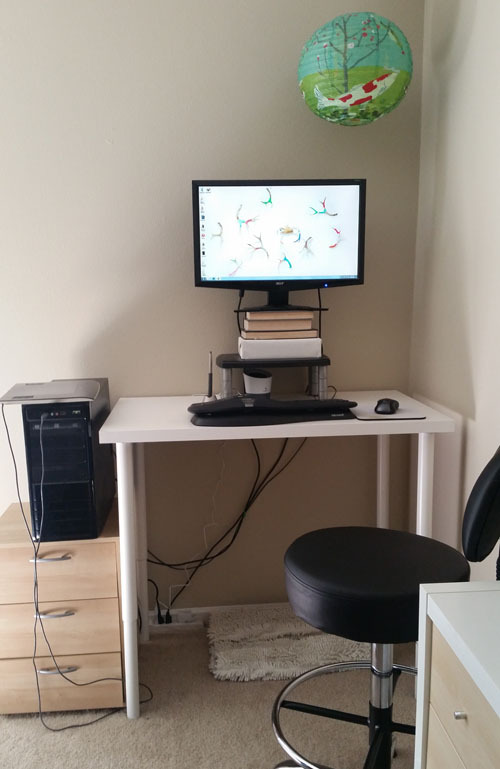 Veridesk has a fairly affordable ($350) setup which rests on top of your existing desk. 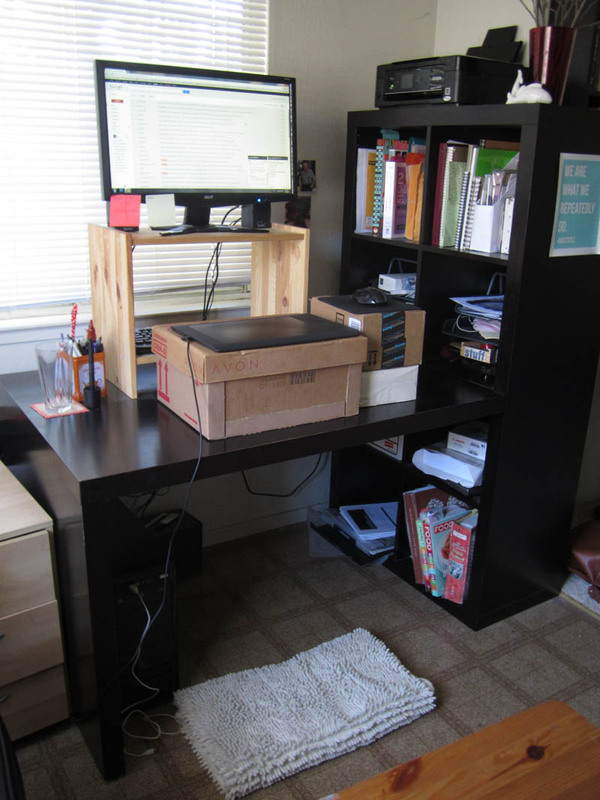 A cheaper alternative is to make your own using "IKEA hacks." Just Google "IKEA standing desk hacks" and you'll find all sorts of cheap and creative setups. 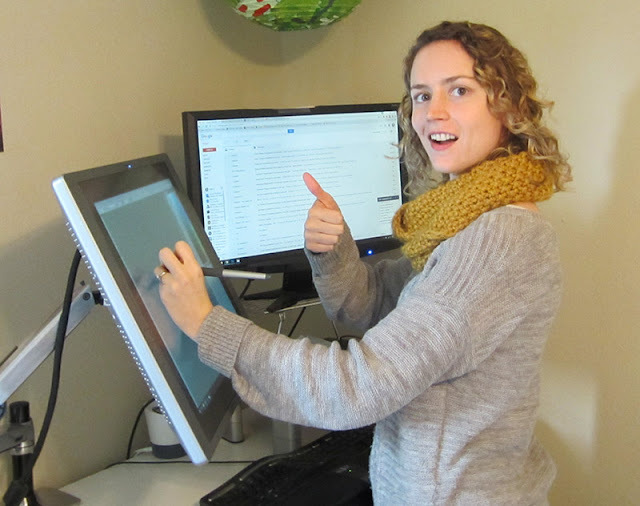 Before I got my Cintiq, my setup was very simple: a LINNMON table top ($8.99) with four OLOV adjustable legs ($15 each). My monitor rests on a EM Adjustable Monitor Stand ($25) and some books, for a total cost of $94. 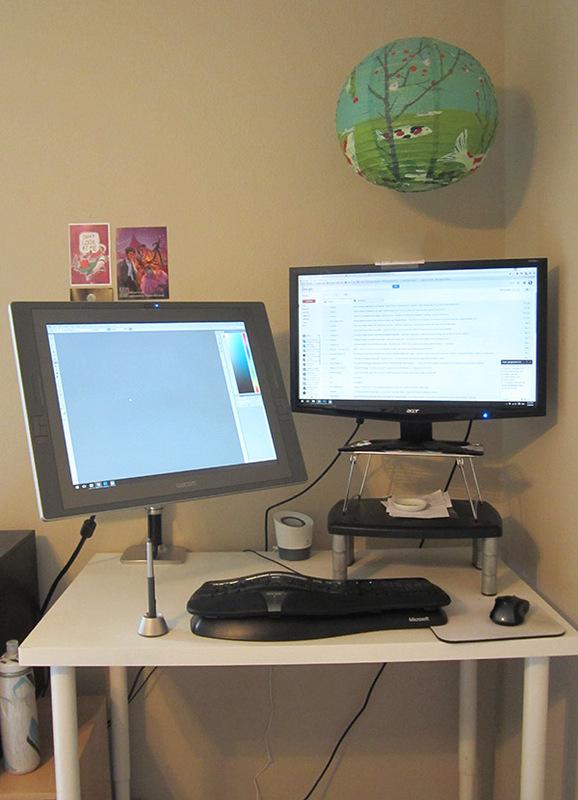 Now, with the Cintiq, I use an LX Desk Mount Arm ($128) to lift the monitor to the correct height. It's a little cramped, but it works. I also use an IKEA bar stool, which I bought used on Craigslist for $20. If you're near an IKEA, new ones cost $45. Here's my husband's setup, which is a little more complex because he uses two computer monitors. 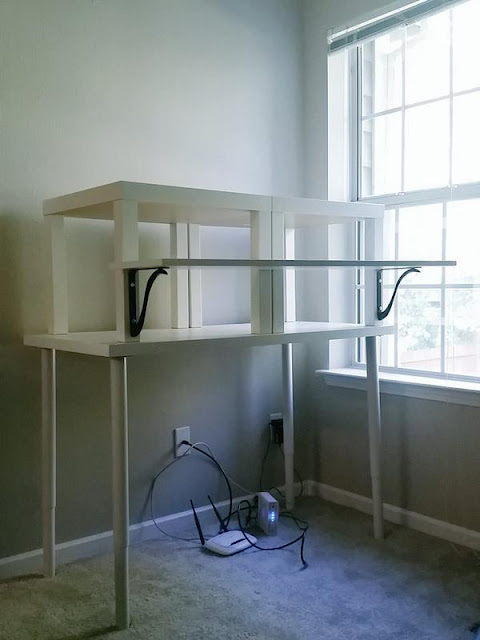 It uses the same table legs, along with two LACK side tables ($7.99 each) and a shelf with brackets. 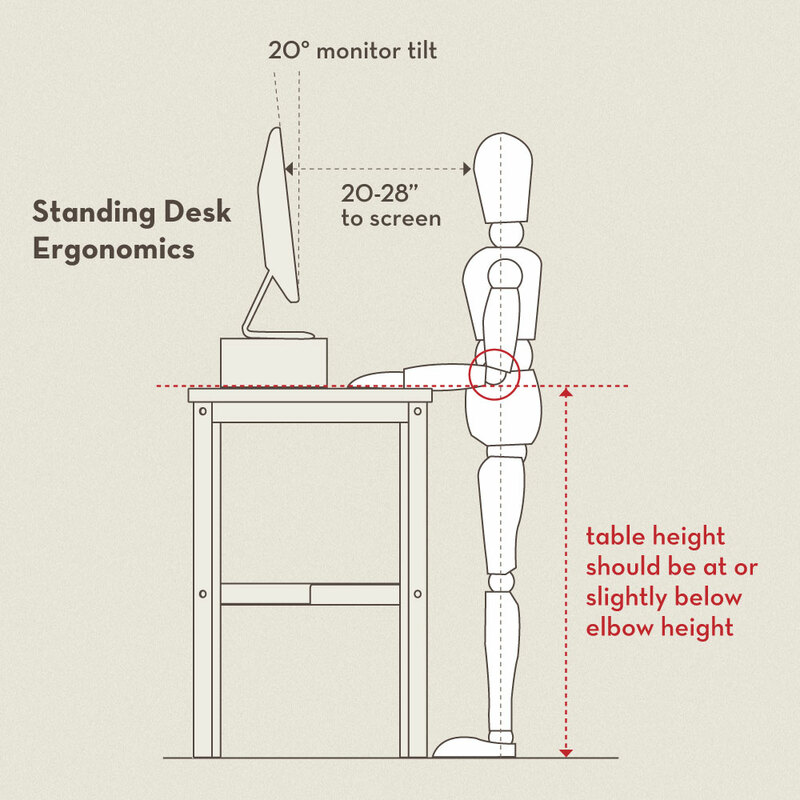 If you give standing desks a try, let me know how it goes for you! You can even send me a photo of your setup. Just hang in there through the first week or two, I promise it gets better. According to the video, most of us should be dead by now.